In times of economic uncertainty, businesses that deal in food production such as restaurants, hotels, schools and hospitals look to reduce overheads in any way they can. And FiltaFry has found a niche service that blends the benefits of cost reduction with the social responsibility of being eco-friendly. It’s rare that environmental initiatives go hand in hand with profit strategies, but FiltaFry is a green franchise that has managed to combine the two. FiltaFry introduced oil micro-filtration to the UK in 1996 which removes the impurities out of cooking oil so that it can be used for a much longer period. This has many benefits. It improves the quality of food, increases the life of the frying systems, reduces oil costs by up to 50% and lowers the impact on the environment. Fryers are an essential piece of equipment for any commercial kitchen, but they can be expensive to run and maintain. To clean the fryers, the oil needs to be discarded every couple of days. This is costly and inconvenient, both financially and for the environment. The complete fryer management service which customers receive from FiltaFry provides a consistent, safe, and reliable filtration solution. For their convenience, used cooking oil is disposed of safely which is then recycled into other forms of renewable energy such as Bio-Diesel. Each business then receives fresh oil saving them time, effort and money. 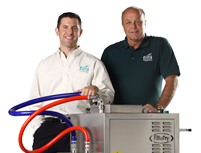 By investing in a FiltaFry franchise, you’re removing the need for businesses to rely on manual filtration that can result in food safety issues and employee safety concerns. You’d be providing an invaluable service for businesses and shaping how they deal with green initiatives going forward. As well as the satisfaction of helping businesses save money and reduce their impact on the environment, you’ll also get to enjoy the freedom and flexibility that comes with being your own boss. As this is a van-based franchise, you can effectively choose when and where you work and arrange your schedule to fit around other commitments. You can also establish and grow your business at your own pace too. When you first become a FiltaFry franchisee, you can start with one van and build up a strong customer base which will generate a steady income through weekly repeat business. As and when you’re ready to expand your business you can purchase additional vans and operate a multi-van franchise. This will involve hiring employees to continue the microfiltration service for your customers while you concentrate on further developing and growing your franchise in more of a managerial role. To become part of this differentiated franchise, an exclusive territory is available for a total investment of just £14,950 plus VAT. In return, you’ll receive all the training and equipment you need to get your business started. When you’re up and running, you’ll pay a fixed royalty fee of £500 per month to fund the ongoing support that you’ll receive and the continued development of the franchise system. FiltaFry understands that the brand can only continue to enjoy success if its franchisees receive quality training and support. You’re essentially investing in a franchise system that has been tried and tested with a proven track record of success. You’ll receive advice and guidance from an experienced support team to avoid the common pitfalls which many business owners can make when just starting out. Comprehensive two-week training programme: One week will be classroom based and one week will be spent learning on the job with an existing franchisee. On-going eight-week development plan: You’ll get to work with an independent coach and mentoring specialist to help you develop your sales skills and set your personal development goals. Assistance to launch your business from a dedicated Business Development Manager. Telephony support available for any sales and business queries. Access to a bespoke online CRM / electronic invoicing system. As well as the support provided, you can be sure that your investment is secure with a FiltaFry franchise. Demand for oil filtration is expected to increase 25% annually for the foreseeable future as more and more businesses focus on going green while reducing costs. If you’re interested in opening a FiltaFry franchise, you’ll join 350 franchisees who represent the brand on every continent around the world. What better way to make a profit than by making other businesses more profitable and eco-friendly at the same time? This is truly an excellent opportunity to become part of a thriving franchise providing a service which is so niche it has virtually no competition.